ARCHITECTS LOVE METAPHORS. Lay readers of architects’ design statements or, especially, architects’ award citations, might think the profession has gone trappo over tropes. Why so much figurative speech? In part, metaphoric usage is a habit, but it’s also a sign of good intentions. Architects talk and write this way because they are trying to communicate ideas that, if expressed in the profession’s own dialect – the language of sire seaward side and plan, programme and composition – would be generally incomprehensible. Believe it or not, when architects engage in linguistic transference, they’re just trying to connect. Architecture being, among many things, a feedlot for already healthy egos, it’s not surprising that its practitioners prefer metaphors of epic connotation. One of the all-time favourites is that of the journey. The design of a house, the building of a house, the act of moving through a house – they’re all ‘a journey’. (Of course, as houses get bigger the term risks reverting to mere description: some modern piles should come with maps, not plans.) 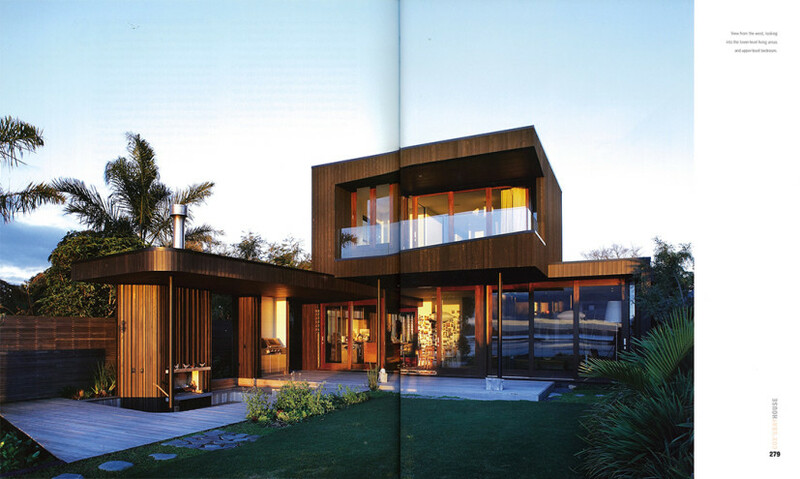 Sure enough, Nicholas Stevens and Gary Lawson , the architects of this house on a cliff above the Waitemata Harbour at Westmere, and their clients, turn quickly to the J-word when discussing the house, both as idea and realised form. But, in this case, the reach doesn’t seem at all like a stretch.The house really is quite a trip. 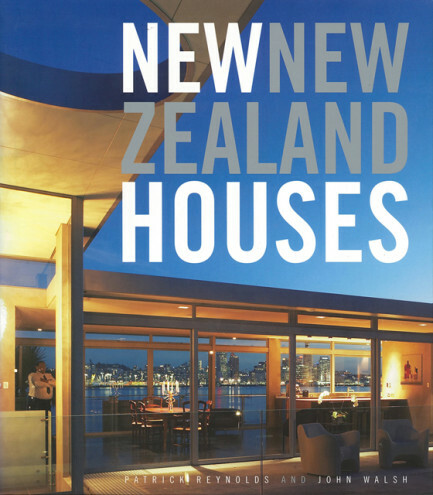 The new house replaced a stucco bungalow that, with its boat-builder owner, were survivors of the old Westmere order. Before recent gentrification, Westmere was an ordinary suburb that became posher, but not much flasher, at its coastal edge. The pronounced tidal behaviour of the Waitemata around Cox’s Bay repelled wealth, mud and money not being natural neighbours. Well, not then; now all coasts are desirable, no matter what the ebb tide reveals. The old bungalow, with its sheds, concrete yard – the previous owner was a very hard landscaper – and still-extant jetty and boat ramp, formed a rambling compound, the sort of set-up reasonably common around Auckland down through the twentieth century, when the city had a loose ease that, to the rest of a buttoned-up country, was sinfully close to profligacy. It would be hard to find a more telling sign of a suburb’s changing fortunes than the supplanting of an accretion of artlessly functional structures by one of Stevens Lawson’s highly crafted bespoke houses. High on the shortlist of every affluent discerning client, sure- fire awards winner, and mediagenic to boot, the practice inevitably attracts some professional envy. The architect’s F-word – ‘fashionable’ – might even be uttered (to which Stevens Lawson might reply that if you’re going to do couture, it might as well be haute). But the practice partners are intent on pushing themselves and, perhaps, their clients, and extending their range. Recently, for example, the practice has won competitions to design a civic precinct in Queenstown and a complex for Auckland City Mission. 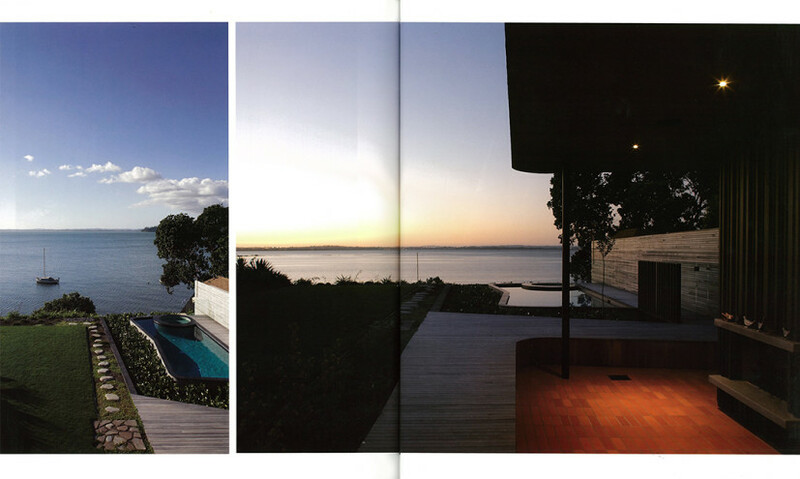 The clients for the Cox’s Bay House seem, from an architect’s perspective, close to ideal. They had the means, motive and opportunity to commit architecture, and they had ideas, but not closed minds. In the brief for their new house, the clients set down what they did and didn’t want. 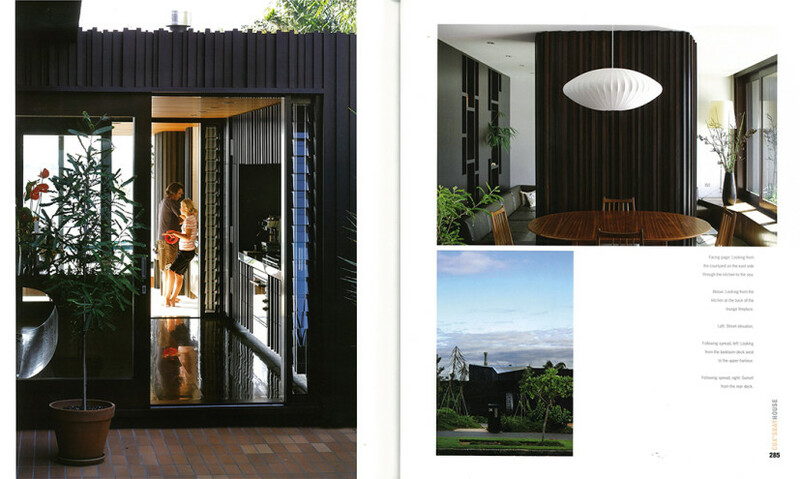 For a start, they wanted a wooden house that was not ‘a big Auckland box’ and would resist easy periodisation; they didn’t want too many right angles; they wanted ‘secret thin gs’ rather than a ‘what you see is what you get’ open plan; they wanted courtyards; they didn’t want a front fence or an assertive face to the street; they wanted calmness and serenity, and also ‘a certain feeling of being on holiday’; and they wanted a house that was black, the colour of their previous home, a celebrated work of mid-century modernism, the Mann House (1960) in Mt Albert, designed by Ivan Juriss. They’ve got what they asked for, and then some. This is a surprising house, or rather, a house of surprises. Unlike other new architect-designed houses in this street, which either pointedly reject the street or aggressively advance upon it, this house recedes from its public frontage. One could almost say it slithers or wriggles away from the street – the architects themselves call it a caterpillar – and this sense of shy withdrawal will only become more pronounced as the front planting grows. It takes confidence, on the part of clients and architect, to deal with a New Zealand suburban street in this manner.The dumb instrument of the fence is here replaced by a strategic approach, in which siting, form, colour and landscape are all deployed to safeguard the private realm. 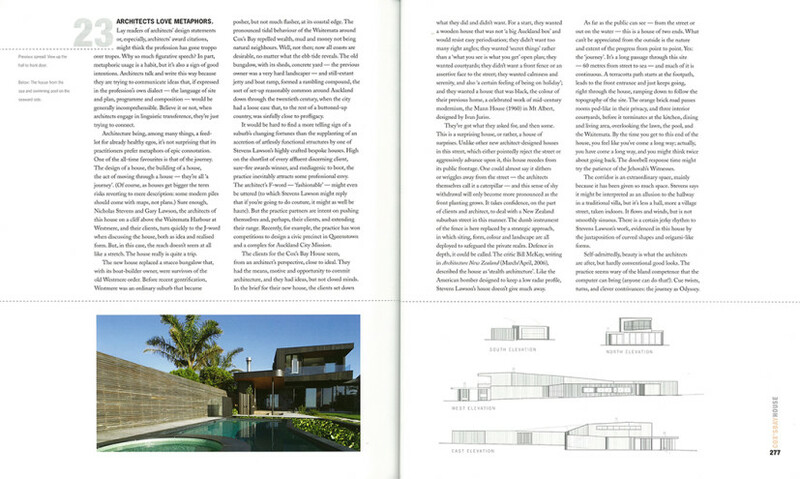 Defence in depth, it could be called.The critic Bill McKay, writing in Architecture New Zealand (March/April, 2006), described the house as ‘stealth architecture’. 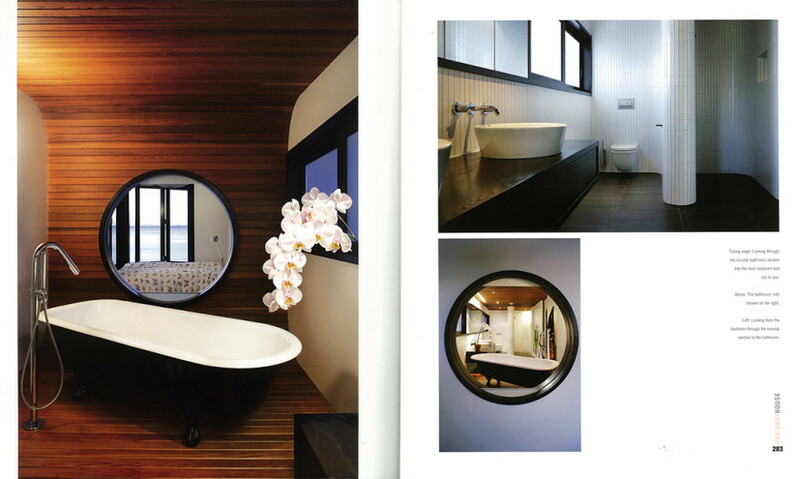 Like the American bomber designed to keep a low radar profile, Stevens Lawson’s house doesn’t give much away. As far as the public can see – from the street or out on the water – this is a house of two ends. What can’t be appreciated from the outside is the nature and extent of the progress from point to point. Yes: the ‘journey’. It’s a long passage through this site – 60 metres from street to sea – and much of it is continuous. 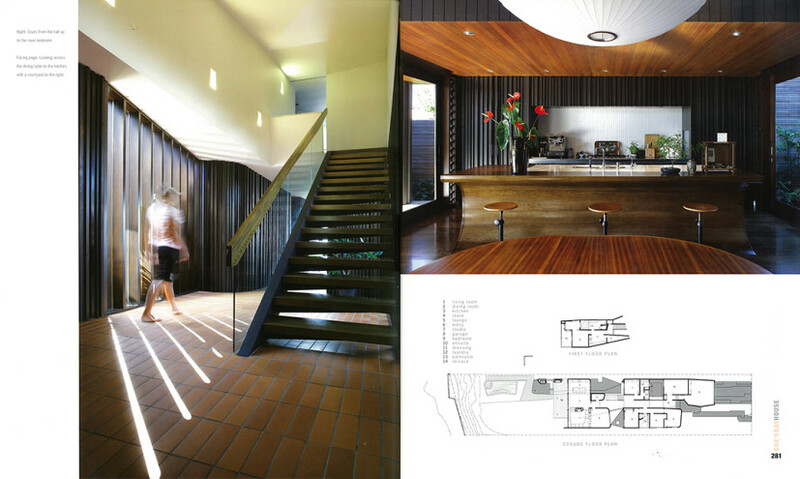 A terracotta path starts at the footpath, leads to the front entrance and just keeps going, right through the house, ramping down to follow the topography of the site .The orange brick road passes rooms pod-like in their privacy, and three interior courtyards, before it terminates at the kitchen, dining and living area, overlooking the lawn, the pool, and the Waitemata. By the time you get to this end of the house, you feel like you’ve come a long way; actually, you have come a long way, and you might think twice about going back. The doorbell response time might try the patience of the Jehovah’s Witnesses. The corridor is an extraordinary space, mainly because it has been given so much space. 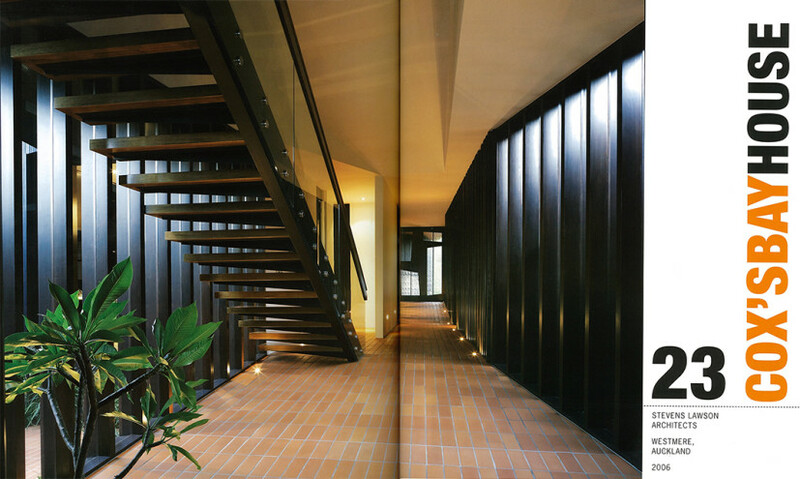 Stevens says it might be interpreted as an allusion to the hallway in a traditional villa, but it’s less a hall, more a village street, taken indoors. It flows and winds, but is not smoothly sinuous.There is a certain jerky rhythm to Stevens Lawson’s work, evidenced in this house by the juxtaposition of curved shapes and origami-like forms. Self-admittedly, beauty is what the architects are after, but hardly conventional good looks. The practice seems wary of the bland competence that the computer can bring (anyone can do that!). Cue twists, turns, and clever contrivances: the journey as Odyssey.